The Social Media Research Foundation is the home of NodeXL – Network Overview Discovery and Exploration for Excel (2010, 2013 and 2016) – extending the familiar spreadsheet so you can collect, analyze and visualize complex social networks from Twitter, Facebook, Youtube and Flickr. A growing number of academics, market strategists and social media managers from around the world make use of this easy-to-handle tool. You can, too! If you can make a pie chart, you can now make a network map! Mapping, measuring and understanding the landscape of social media is our mission. We support tool projects that enable the collection, analysis and visualization of social media data. The Social Media Research foundation is supported by a global network of academics from a wide variety of disciplines. NodeXL supports all features to conduct professional social network analysis (SNA): Community clustering, influencer detection, content analysis, sentiment analysis, time series analysis and a lot more. Networks are everywhere – but few people have learned how to see them or understand them. Whenever things connect to one another Networks are formed. People talk to people, businesses trade with businesses, and machines connect to machines: all of these create networks. Once you learn to see networks you discover that they are everywhere! Social network analysis (SNA) is a powerful way to organize a connected world. Network analysis can reveal insights into the ways things (like people!) connect with one another and form groups. We live in a “Network Age” – but many people cannot “get” a network, do not know where to “put” a network or how to calculate and visualize insights into a network. For a “Network Age” network skills are not widely found. For people who do not program, networks are often just out of reach. Network analysis can be made simpler! NodeXL is an SNA Tool that places network analysis inside the context of the familiar Excel spreadsheet. NodeXL adds menus and features to Excel to simplify the tasks of getting network data, storing it, analyzing and visualizing it, and generating reports that share insights into connected structures. Have a look at recent news on current updates and events in the Blog section and sign up for our Newsletter. 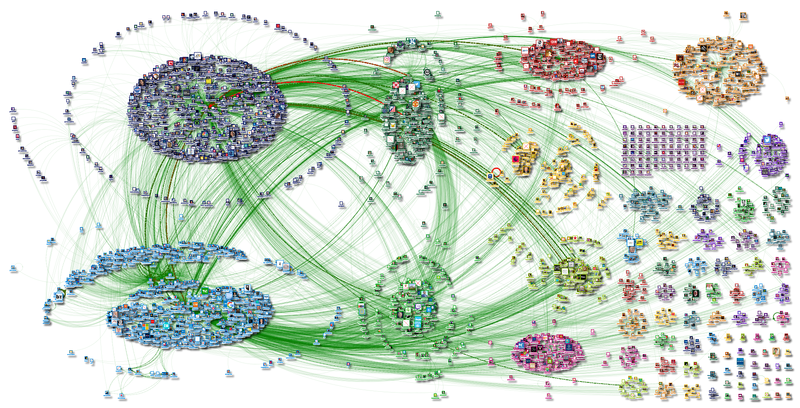 Get NodeXL Pro today and map your own networks.